In my articles you’ve heard me talk about accumulating on weakness, buying support, being patient and waiting for better opportunities. Folks, this next week is one of those opportunities. The mining stocks have been a disaster if you’ve invested in the average fund, GDX or GDXJ. If you’ve invested in the wrong stocks, they’ve been a total disaster and you now hate the sector forever. We’ve certainly been surprised by this protracted struggle. However, the gold shares are set to test a major bottom and could be on the cusp of a major reversal which could begin as soon as next week. The gold stocks are setting up similarly to the bottom in 2005. Let me explain. 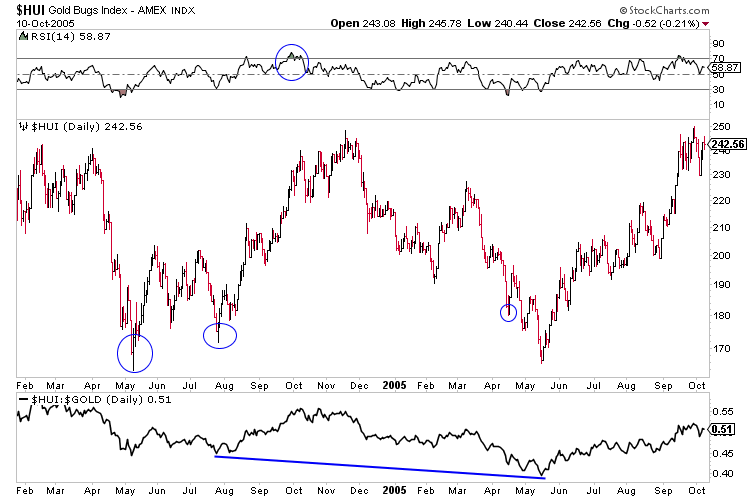 The gold stocks made a major double bottom in 2004 and 2005. The first bottom occurred in 2004 and the second in 2005. Interestingly, the 2004 bottom was its own double bottom. Following that the gold stocks rallied significantly for several months before eventually giving it all back. Note the circles on the chart as they compare to the current situation. Below is a chart of the HUI in 2004-2005 with the HUI/Gold ratio plotted at the bottom.